It's that time again: the review of our recently completed school year. For some aspects it feels like a post-mortem analysis of what went wrong, while others are glowing confirmations of our happy homeschool life. 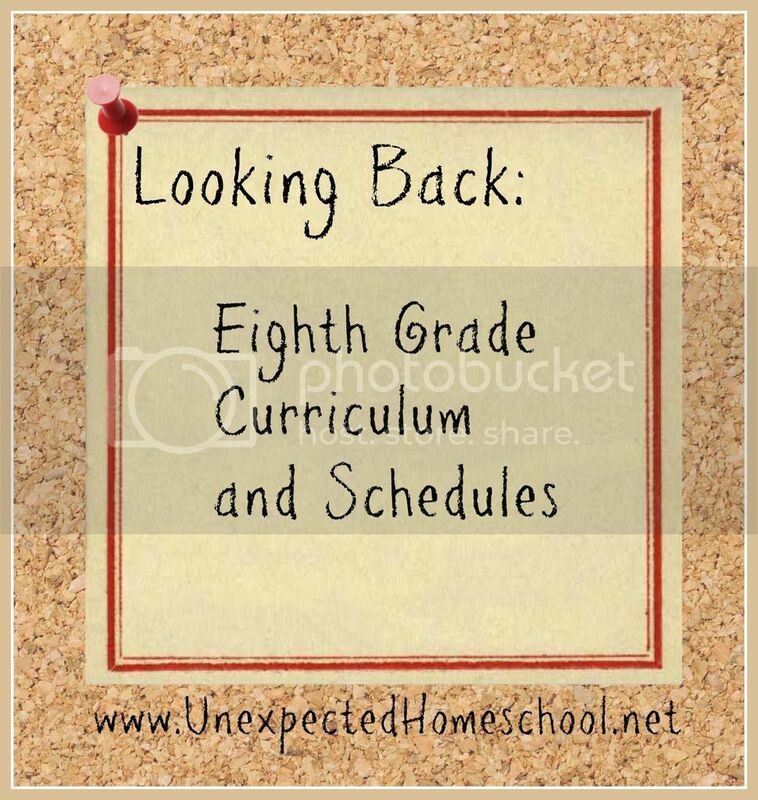 In preparation for high school lesson planning this Summer, I've gone over general facets of our school days and the specifics of how our eighth grade curriculum selections worked. We had multiple schedule changes this year in an attempt to accommodate the addition of various therapies and treatments for Amber. None of the schedules were perfect. We do like the ease of having appointments during school hours, as opposed to loud, busy waiting and treatment rooms after schools let out. However it makes for a disjointed schedule with quite a few interruptions. Our end decision is to keep the appointments during school hours and work on a more defined daily at-home schedule. Our homeschool co-op will be offering more core high school level classes next year, but our philosophy has always been to only use co-op for enrichment or elective classes. Seeing how difficult it was for us to keep up with Amber's medical schedule plus classes at home this year, we are definitely still committed to our enrichment-only philosophy. We can't guarantee she will be able to stay on a preset course schedule and want more control over course content than outside classes allow. Video lessons remained a positive aspect of schooling by providing the additional stimulus Amber needs on some days. Just last week Amber's occupational therapist was going over some strategies with us to help Amber retain more of the information she is exposed to during school. Video lessons for some topics will remain an active part of Amber's high school years, while physical books instead of e-books may make a bigger impact for other situations. On the topic of curriculum selection, we learned the hard way that even if Amber likes a product and honestly wants to try it, this still doesn't mean it is a good fit for her needs. I need to listen to both my instinct and Amber's opinions prior to making a determination on the viability of a curriculum. Similarly to above, but ever so subtly different, if we struggle to use a curriculum it needs to be rethought sooner as opposed to later. Even if this curriculum was acceptable a year prior. I'm still kicking myself over this one, while Amber finally admitted she honestly has always found the particular offender to be rather dull, dry, and not her learning style. How did our specific selections fare? We ended up using many more products than listed on my original curriculum lineup because of being part of the TOS Review Crew. Some of those review items we stuck with and completed the product, while others we used only for the duration of the review. Below are our thoughts only on the items we originally selected at the beginning of eighth grade. History - Tapestry of Grace - We have been very pleased with this over the last two school years and plan to continue with it for high school. After trying portions of the wide array of subjects offered in Tapestry of Grace, we have chosen to use the history, government, and philosophy sections for high school. Although the past two years we have supplemented it quite a bit and extended a single year of TOG into two school years, for the future we will limit our supplements and stick closer to their suggested schedule. Math - Life of Fred Math - This has been an answer to Amber's math nightmare. She plowed through Algebra 1 and has made great progress through Advanced Algebra (Algebra 2). We plan to continue with Life of Fred Math through high school. Although we had great plans to supplement with CTC Math, Amber didn't do much with it over the school year and does not necessarily like online math. Grammar - Analytical Grammar - Suddenly early in eighth grade I was notified by Amber that this particular grammar program was "boring and tedious", but she would continue with it. I let it go with that, but really should have investigated more. Turns out, she's never been terribly fond of it but thought it was good enough. She honestly misses BJU English. We made little progress through the second season of Analytical Grammar and I have finally given up. We tested out another grammar curriculum that she likes infinitely better and will begin with it full time in August. Writing - IEW SWI B - Amber loves almost everything from IEW. She made huge strides in her writing while completing SWI B. We have already purchased the SICC B to continue through the IEW courses in high school. Creative Writing - Cover Story - Amber liked this, but got bogged down at one point. We found ourselves running out of time many weeks and was either this or IEW - we often chose IEW over creative writing. Amber wants to try out the One Year Adventure Novel from the same people for her creative writing course in high school. Literature - Illuminating Literature - Amber very much liked this curriculum and the selection of novels. However, we did not finish all the books listed due to time constraints and other review items. At this point we have decided to not even try to finish Illuminating Literature. We are moving to another curriculum line for all four years of high school and so will finish Amber's current novel over the summer and leave the rest of Illuminating Literature unfinished. Science - Apologia Physical Science - This one is tricky. Amber says she likes it and that it's not at all boring. Normally I would believe her on this, except see the grammar above. Then there is the issue that she's only half finished with physical science after a year of school. Whenever she had the option to do just about anything else, including math, she chose it, despite loving these science topics. This leads me to believe that it isn't actually a good curriculum match for her. I think Amber really wants to like the Apologia curriculum and does not have any huge complaints about it, but somehow it isn't working for her. Oddly in conversations with other homeschoolers, Amber will tell them the Apologia Physical Science is fantastic. Yet she can't bring herself to finish it. SOS Missouri History - Due to difficulty of use, incorrect information, incorrectly marked test questions, and that it is terribly dry, we have decided to give up on this and work on Missouri history independently. Logic - Fallacy Detective - Amber LOVES this. We haven't quite finished it yet because of additional items that were added during the year. She's working on it for fun at various times, but Fallacy Detective will remain as a supplement to her high school logic course until it is finished. German - Prima - Amber had quite a few flares of her dysautonomia and gastroparesis over the school year. One of the first subjects we dropped when needing more rest time was German. The curriculum is fine, we just need to pick it back up this summer. Some of it is my fault because it does require me to actually teach as opposed to overseeing. Which you'd think wouldn't be a problem since I am teaching this exact curriculum in our homeschool co-op. Religion - Amber liked all of the selections we made, but we haven't finished everything yet. Confirmation classes and homework, plus a review of Grapevine Bible study slowed us down. Using what we've learned from this year, hopefully high school will be smooth sailing. I have tried two different things when it comes to doctor appointments. One ~ only scheduling them on a certain day or two of the week ~ didn't work well. The second was to refuse any appointments before noon unless they were medically necessary (fasting or surgery). This works most of the time for us and gives us a buffer. You all accomplished a load of learning this year. My kids are in love with Life of Fred too. I just can't bring myself to let it be the ONLY math. However, I really don't know what I am going to do with Dean next year. It was really interesting hearing your thoughts on the curriculum. I picked up a little gem at a garage sale that might interest you for Missouri History. It's called "Missouri: Then and Now" by Perry Mccandleuss and William E. Foley. It's a textbook, but looks very promising! There are 18 chapters, not too daunting, with lots of good extension activities at the end of each chapter. My kiddos are going to work on this one day per week and choose one thing from the extension activities to complete with each chapter. You can purchase these used books on Amazon. Good luck! Well... It was going to be Excellence in Literature, but we changed our mind this past week before even acquiring the EIL books. We are using Teaching the Classics sold by IEW (Institute for Excellence in Writing). Teaching the Classics will allow us more freedom in our high school literature over the next four years.